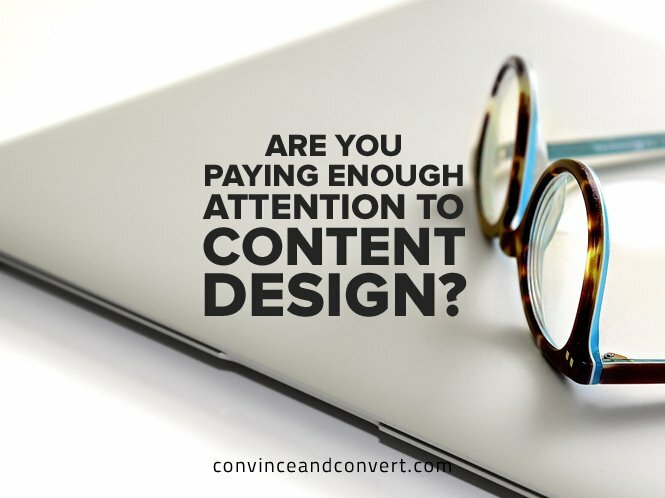 Are You Paying Enough Attention to Content Design? Cohesion in all arenas of a marketing plan can make or break your success. However, some initiatives are paramount, specifically converging content and design in a way that logically and emotionally aligns them. The correlation of content marketing and design needs to be an art, a strategy, and a science. No matter how thirsty you make your audience, they’re not going to drink it if the trough at the end of the trail tastes bad. Gary Vaynerchuck, the mythically impressive social and content expert, reminds us to simply “market like the year you are in”—advice that a startling number of major brands have failed to take, sometimes resulting in a quick decline in content ROI, and other times a slow death by a thousand cuts. What does this mean for marketing plans in 2016 and beyond? 60 percent of marketers create at least one fresh, new piece of content everyday, but it takes a customer less than one second to judge your brand once they reach your website. Yikes! This means that all aspects of your marketing outreach need to evolve as a living, breathing entity. No matter the company size, industry, or overall goal, no brand can afford to ignore these vital steps to maximize success. We like to think we rationalize most of our spending decisions, but in truth (as Square 2 Marketing points out), purchases are made on a base, emotional level. Whether or not we realize it, admit it, or understand it, when faced with the need or desire for a new product or service, a base part of that drive comes from an emotional connection. The marriage of content and design play a crucial role in that connection. Many of us know the basic checklist: Headers catch the most eyes at 50–60 characters, keep your homepage to a three-Pantone color scheme, etc. Now that the internet isn’t as much like the Wild West as it used to be, a specific array of sourced and cited educational copy within a mapped design space is crucial. When it comes to content marketing, Chief Inbound Scientist Michael Lieberman outlines how to position copy so that it “appeals to all prospects of all stages of the buying process [to] ensure you get leads for the top, middle, and bottom of the sales funnel.” Wireframe/content integration and design need to be woven into an optimized tapestry. This can be the tipping point of a successful user experience. Lieberman lays out a rough blueprint of what it looks like when building ideal inbound design. He recommends that marketers first take inventory of all their current content and design assets, as well as those in the pipeline. Next, it’s time to organize them into brackets that adhere to the structure outlined below. This inventory of current and future assets will allow you to see potential relationships that allow content and design to build on one another. Whether you have an in-house creative team, outsource to an agency, or want to find a website builder to do it yourself, the importance of convergence remains the same. Awareness: This could be affixed to both PR and outbound or organic marketing efforts. Think educational and entertaining blog posts, sticky and shareable social media content and images—anything you’re doing that exists outside your homepage with the intent of driving traffic and conversions to or on your homepage. Interest: White papers, webinars, newsletters, email marketing, and viral threading of purpose and logo affiliation that establishes your product or service as a unique solution. Desire: To create desire, you must catalog and expand on the stickiest aspect of assets ascertained in the “interest category.” Think featured lists, on-brand cross-promotions, casually inviting case studies, and buzz-worthy mentions. Action: The “meat and potatoes” of content and design convergence lives on the homepage, where the actions and conversions generally take place. Think product demos and low-risk (or no-risk) offers that appeal visually and connect verbally, which brings us to the holy grail of content and design fluidity . . .
Marketing like “the year you’re in” means lassoing your brand identity. That doesn’t mean every single word or design has to look like repetitive sweater sets at a country club. Rather, we need a controlled handle on the bigger picture (step one above should help you gain an eagle-eye view of assets). All too often, once-mighty brands try to do too much at once and spiral out of control. There’s a difference between orchestrating bracket or target-market outreach that appeals to multiple demographics and a split brand personality that alienates more people than it attracts. What are some applicable methods to ensure you’re mastering this approach? Again, there’s no right answer, but analyzing the trials and tribulations of other brands reveals a few pitfalls. Think Sears: Once upon a time, Sears, Roebuck & Company was one of the most profitable and trusted brands in in the U.S. Since its IPO in 1906, it’s risen to become a household name and a trusted source of appliances, furnishings, and clothing. This Goliath that was once the largest retailer in the free world now laments more than 30 straight quarters of revenue decline, with a recent quarterly loss of more than 580 million dollars. Wall Street 24/7 now predicts Sears will be headed for extinction within the next year. Naturally, there are multiple mitigating factors in such a great demise. Some can be more strongly pinpointed than others; many involve content and design. Mismatched content brackets and poorly executed design had a swift hand in Sears’ decline, according to Forbes. Aside from over-diversifying investments in the late 1980s (which further split the potential convergence of many demographics), Sears divorced leadership in its main divisions in 2006, causing each segment of the company to restructure independently without cohesive content and design. The Appliance sector tried to compete with Home Depot, while their Household and Apparel sections each tried to out-pace retailers like Wal-Mart and Target. Each segment branched their own content messaging and design strategy, which inevitably led to “a brand divided being unable to expand or stand.” The website became a mess; national ad campaigns and content marketing initiatives devolved into a confusing blur. Even now, Sears’ waning homepage doesn’t visually or contextually target or stand apart from competitors. Design for content: Remember that they go hand-in-hand. Concentrate on connection. Mismatched tone and visuals can be a connection killer (i.e. the modern version of trying to market appliances and fine jewelry, like Sears, in the same breath and with the same design style). Define audience: It should go without saying that if content is soft and silly, then abrasive imagery will kill the impact. Let content and design work together to avoid overcrowding text and featuring too many mismatched, overlapping images. Analyze and revise with a purpose: Big and small brands alike deal with having too many cooks in the kitchen. Yet it remains imperative that project owners spend time revising. Allocate time for semi-final campaign assets and drafts to be reviewed and assessed by major stakeholders. That said, even before drafts are proposed, the team needs to come together and decide on a united purpose. Once that purpose is solidified, you’ll be better positioned to divide and conquer. While there are innumerable clips, statistics, and sound bytes being slung toward marketing executives from every angle, they’re often more reliant on “flash” than function. These “tips” try harder to catch your eye than provide sound advice. It takes more than one technique to tame, maximize, and conquer your ROI desires—and it all starts with the ability to co-saddle content and design.